There are somethings you plan for... But, Capoeira was Baba's destiny. On the opening day of his French restaurant at a mall in Israel, he noticed for the very first time a dance studio resonating with drum beats. “When I entered the studio, I saw a big hall, people singing and clapping in a circle and two people playfully fighting inside it. The energy in that room was incredible! That was my introduction to Capoeira,” says Baba. And then, there was no turning back. Baba learnt Capoeira under Contra Mestre Cueca in Israel for many years before moving to India and setting up the first official Capoeira school in 2006 - Cordao De Ouro India. 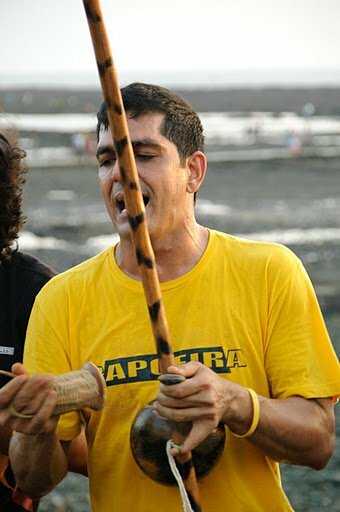 It would be very difficult to describe Baba in just a few words - his talents range from Cooking to Capoeira (Bbqs and Berimbaus). 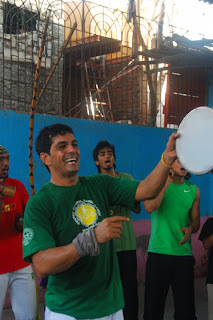 His passion and dedication has really taken Capoeira to what it is in India today. With a beautiful smile and an extra large heart, Baba is a delight. Come and experience Capoeira with our teacher - Instrutor Baba !